This introduction to Indoor Skydiving gives you two 1 minute 'flights' in a huge vertical wind tunnel, giving you a perfect skydiving simulation in the safest possible environment! Indoor Skydiving ... is that even possible? The answer is YES ... and it's thrilling fun! 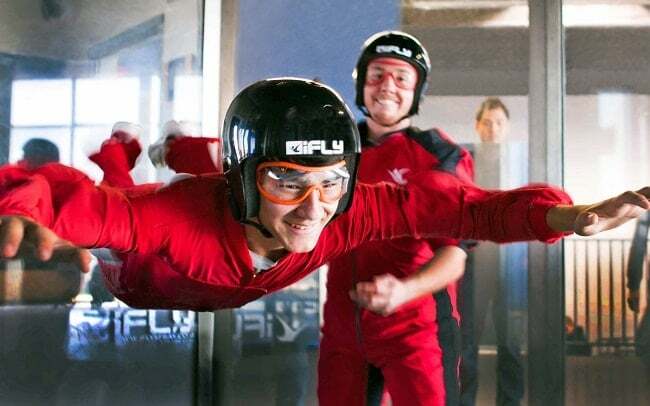 Using a wind tunnel that could be used for testing the aerodynamics of an F1 racing car, you will step into the airflow and then you are skydiving .. it's as simple as that. It's an amazing concept that allows you to taste the thrill of free fall in a completely safe environment. 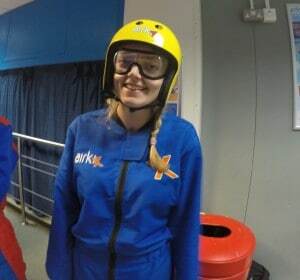 This fantastic Discover Indoor Skydiving Kick-Start experience will give you two x 1 minute flights (that's as much freefall as 3 tandem sky dives!) in the wind tunnel where you will get to perfect your basic free fall technique! In each of your one minute flights, you will fall a distance equivalent to 2 miles! An optional DVD is available at the end of your experience to help you remember your day - not that you're at risk of forgetting! Great fun guaranteed. The wind tunnel is as close a simulation of actual skydiving as can possibly be achieved, and is - quite literally - an absolute blast! As you step into wind that is powerful enough to lift you from solid ground all the way to the top of a 20 foot tunnel, you just straighten your arms and let yourself fall forward into that wind. There will be an instructor present throughout your two Indoor Skydiving 1 minute flights, and he/she will coach and advise you with hand signals, as you bob around on a bed of air, like a cork in water.Indoor skydiving is a unique experience offering you the chance to understand what it is really like to jump out of a plane and free fall. During your 2 minutes of flight you will get the same freefall time of 3 actual skydives, and expert tuition from the professional instructors. After you have mastered a few techniques with the instructor's help you can really appreciate the fun involved with freefall and begin to maneuver yourself around the tunnel. Indoor Skydiving is available from 11am to 10pm weekdays. 8am to 10pm weekends & Bank Holidays. Please Note: You will be required to arrive at least 1 hour before your flight time to cover the introduction and safety briefing. You cannot fly if you: Are heavily pregnant, are under the influence of alcohol or non-prescribed drugs, are wearing a hard cast or have previously suffered a shoulder dislocation. Anyone with a history of neck or back problems or heart conditions should seek advice from their doctor before flying.If you wear glasses, goggles can be supplied that fit over them. You will be at the centre for around 90 minutes in total. Participants: The Indoor Skydiving Kick Start is for 1 participant. There is a free viewing gallery with disabled access and spectators are welcome. All specialist equipment including flight suit, helmet, goggles and pads are provided by the centre. Please wear tight, lace-up trainers (or skate shoes). In the event that your shoes are unsuitable the centre will hire you a pair. You will be provided with a flight suit that fits over your normal clothes. So come dressed casually wearing trousers and a shirt with preferably a button-down collar or no collar such as a T-shirt. This was my second time at ifly (previously airkix). Aside from the limited availability and having to go at 8 am, we had a great time. Instructors took great care and time with us along with helping a very nervous flyer. Wish we'd have longer in the tunnel for a more reasonable price, or a cheaper add ons. I paid extra £7 to go higher- I personally don't think it was worth it but others did. Fun day would recommend if you haven't previously sky dived! Had a great time as an office night out. This was my second time trying indoor skydiving and I was certainly more comfortable. 2 minutes is certainly enough time and it seems like a longer experience as you get to watch the other participants while waiting your turn. 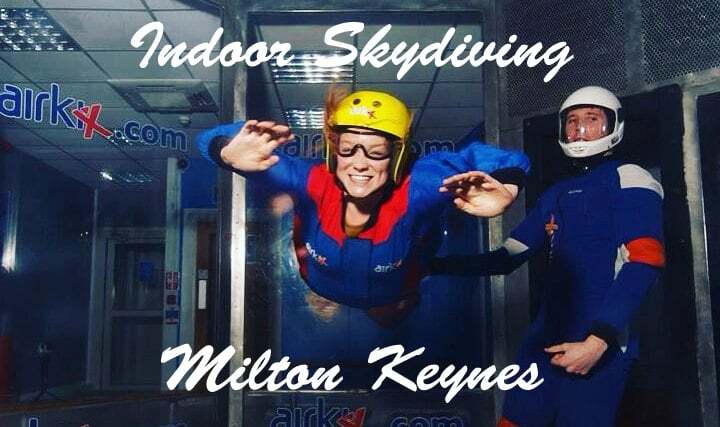 On Friday 27th November the team and I hit the road and headed up to Milton Keynes for an indoor skydiving experience. With it all being our first time flying, the journey consisted of us discussing funny stories of what could happen, and watching previous blooper videos. Definitely not the best way to calm our nerves, but an excellent way to pass the hours of stand still traffic on the M5. Once we arrived at the centre and had all tied our hair into plaits, we met our lovely instructor Glenn, who instantly put us at ease. After we had filled in all the vital documents, we were invited to watch a safety briefing video, before getting kitted up and moving onto the fun stuff! As we made our way over to the wind tunnel to wait our turn, we caught a glimpse of what we were about to experience. The instructor and flyer were chasing each other round the tunnel in what we can only assume was a game of tag, either that or they’d totally lost control! Whatever they were doing, it looked immeasurably enjoyable. Once their session had finished we swapped over, making our way into the glass tunnel and taking our seats in order around the screen. Luckily I wasn’t last in which meant I wasn’t going to be skydiving first! First up to fly was Evie. As she stepped into the tunnel she was instantly lifted by the power of the winds, and she was flying! She made it look easy. On our first round we did some basic flying as we got used to the feeling and technique of how to hold our bodies. Those that had a slightly better knack to it were able to venture up higher, whilst the instructor supervised below. Next up was Cat who also made it look effortless – if they could both do it I definitely could! Or so I thought up until I got into the tunnel, and was hit by the 120mph winds. It’s as if as soon as I got in the tunnel I completely forgot about keeping my body relaxed and my legs straight and I was all over the place, my legs flailing up and down – it’s fair to say I wasn’t the most graceful. It was a good job we got a second flight so I was able to redeem myself. By my second turn I was feeling far more relaxed, especially after watching everyone else and observing the (correct) technique. On our second goes once we had mastered basic flying with the assistance of Glenn, we got to have a go at flying all the way to the top of the 20ft tunnel. Glenn began by slowly spinning us round gradually picking up the pace before we both blasted up to the top and back down again! The feeling was absolutely fantastic, as it made you feel so light and free, whilst enabling you to experience the real sensation of free fall flying. Something I would definitely recommend. Once we had all experienced the thrill of flying, we of course needed an obligatory team photo, to document the moment! Really we should have taken this before we all went skydiving and had that wind swept look, but we managed to style it out! 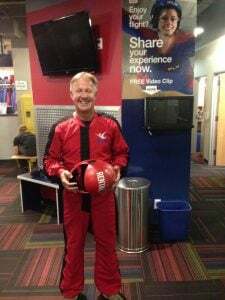 We each received a certificate from Glenn showing which flying skills we had mastered, as well as a downloadable photo and DVD documenting the whole experience – this provided excellent entertainment as my first flight was definitely You’ve Been Framed worthy! If you like the sound of indoor skydiving then grab a gift voucher today. And don’t forget to check out the video of us flying below! From the team at Experience Days. 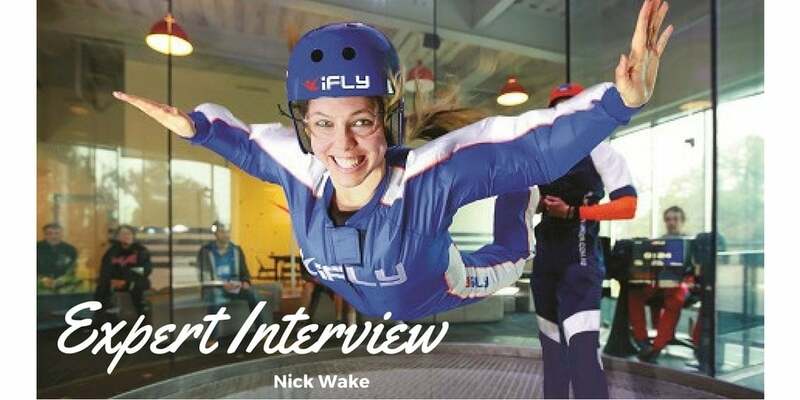 Expert Interview with Nick Wake of iFLY. iFLY’s Nick Wake has kindly taken the time to answer some of our all-important questions. With famous faces, world records and a brief history – this is definitely one to read! Q. How did the idea behind setting up an indoor skydiving club begin? A. Simon Ward founded the UK business in the 2005. A couple of years prior to that he was walking off the drop zone, after his 19th jump of the weekend, when another jumper landed into him at high speed. The impact left him with a broken neck and nerve damage. He got a bit of time to think – 22 months in fact, while he recovered and during that time he thought about indoor skydiving. The first tunnel opened in Milton Keynes, branded as Airkix. 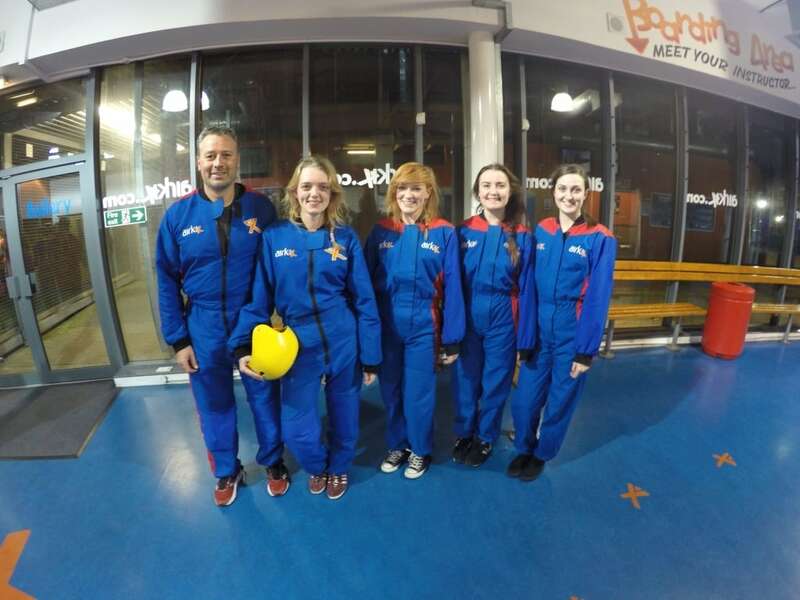 There are now three tunnels in the UK, including Manchester and Basingstoke, which since October 2016 have been operating under the iFLY brand. Q. What would you say makes you unique on the market? A. The experience of flying indoor is totally unique! There is nothing else quite like it. What’s more it not just a thrill ride. It’s a sport, which the more you do it, the better you get. Q. If you had one thing you could tell every customer what would it be? Q. Has anyone famous ever come along on an indoor skydive? A. Over the last eleven years all three tunnels have played host to several events ranging from exciting to unusual including: The Rugby World Cup trophy, a dog flight and numerous wedding proposals. iFLY has also attempted (and conquered) its fair share of world records in its time including solving a Rubix Cube in the wind tunnel (3 minutes, 16 seconds), longest kiss in freefall (31 minutes, 4 seconds) and the first ever ‘longest indoor freefall’ by legendary adventurer, Bear Grylls, together with UK champion Skydiver, Al Hodgson and iFLY instructor Freddy Macdonald. Celebrities love to fly. Shortly before signing for LA Galaxy, David Beckham hired iFLY Milton Keynes exclusively for his family and friends as a New Year treat. Other celebrity visitors also include: England football captain Wayne Rooney, radio DJ Joe Wiley, Take That singer Mark Owen, rapper Dizzee Rascal, glamour model Katie Price, model Elle Macpherson and Motorcycle racer and TV personality Guy Martin who filmed at iFLY Manchester during his TV documentary series, ‘Speed’. Q. What is the best thing about indoor skydiving? A. Pretty much anyone can do it. One of our proudest achievements is our capacity for flying people with physical or mental disabilities. We get involved in lots of charity initiatives and are a great supporter of the British Limbless Ex-Servicemen’s Association (BLESMA). Q. Do you have any plans for the future? i.e. expanding etc. A. Yes. Our mission is to deliver the dream of flight to everyone so iFLY tunnels are popping up all over the world. As for the UK….watch this space! Q. Do you have anything you would like to add that has not been covered? A. Our instructors like to think of themselves as the rock stars of the business and as far as our customers are concerned…they are! What many people don’t realise is that it takes many hours of training and great physical fitness to make it as an instructor. Those that do, get to live their dream of flight every day. Nick Wake, Marketing Director, iFLY. We would like to say a massive thank you to Nick for taking the time to answer some of our questions. Who knew that iFLY has broken World Records and seen so many Celebrity faces!